I feel sorry for British Prime Minister Theresa May. I really do. The more I think of the dilemma she is facing, the more I admire her for ‘keeping her head when those all around her are losing theirs’. The British prime minister’s current predicament is almost Kiplingnesque in nature. 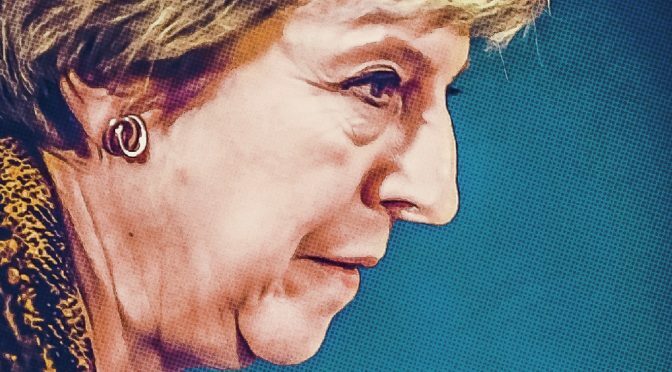 And she’s delivering poetic justice to her rivals by standing her ground and focusing on the task at hand: to deliver a fair Brexit deal with some compromise and less humiliation for her country. But wait. That wasn’t how I felt about her when she took over from David Cameron as Britain’s prime minister three years ago, after his referendum fiasco that saw a majority of Britons voting to quit the European Union. She rarely smiled, looked scheming and appeared to be a repository of dark political secrets. I thought she was waiting for an opportune moment to dish out dirt she had gathered about her political rivals in the Conservative party and outside it. I was scornful of her achievements as Britain’s longest serving home secretary in 100 years and thought she had forced poor David’s hand to call the referendum in a bid to force him out of office. Her plot succeeded, I convinced myself, her subterfuge did her senior colleague in, I thought. But David, whom I admired for a while, albeit briefly, was a grown up and a shrewd politician. An Etonian from the boys’ club, he was born to rule, wasn’t he? Sadly, his biggest mistake was to misread voter sentiment which is rudimentary when you are in public life. One needs to figure out which way the wind is blowing. The people wanted change and the political animal in the man subdued his better instincts. It saddened me that Dave failed to see it coming — the exit verdict I mean. The majority of 30 million Brits who voted (52 per cent) felt they had been in a bad marriage with 27 other countries in the bloc. Perhaps they wanted to be special again, like the former superpower that ruled the seas, that traded and subdued mighty nations. Egged on by the likes of Nigel Farage, a Member of the European Parliament and also leader of the campaign Leave Means Leave, they might have dreamed of former glory as a colonial power, of those endless days of sun ‘which never set on the British empire’. So they wanted out, and they got it. It was that simple. Let me pose an important, basic question here. Why should Theresa May pay for David Cameron’s political sins? She wasn’t a Brexit votary to begin with. In fact, she campaigned against Britain breaking away from the EU. But when her side lost, she accepted the result and decided to move on and deliver what the people wanted. Crucially, she respected the verdict while her predecessor walked into the sunset. I respect her for the dignity she has shown in the face of such mounting adversity. She knows the United Kingdom’s bargaining position with the EU has been weakened, yet she perseveres for a just deal — from maintaining some trade and security ties with Europe while reaching out for bilateral pacts with other countries. Britons know what they want with respect to ties with the EU, but politicians are clueless on how to effect the split. The PM’s rivals within the Tories and the opposition Labour expect to get the ‘best’ deal from the EU while ignoring the fact that the sun set on the British empire long ago. They made noises to dislodge her from the premier’s post yet chickened out because they were themselves wary of being in her position to deliver Brexit. So they threw out her deal after joining hands with the opposition. The ruling Conservatives then came together with coalition partners to defeat Labour’s no-confidence motion which could have triggered an election which they didn’t want. Everyone lost their heads but not the PM who has kept hers as the country lurches from one crisis to the other. What happens now? A delayed Brexit is a real possibility, so is a no-deal scenario, but thr PM would be advised to play for time and build a consensus for a fair deal. With her rivals now out of the way, and her job secure for the moment, Theresa May is positioning herself as Britain’s new Iron Lady with nerves of steel in the Margaret Thatcher mould. So stop being spiteful to her and spare her the sympathy. It’s time to see her in new light. Previous PostWhy are some men on edge over a sharp, sensible ad?Next PostIs an egg more famous than Kylie Jenner?